Hello ... Hello ... my old friends ... It's great to see you once again! This has been a difficult article to write, evidenced by the fact that what you are now reading is my third edit. Nearly a week has passed since an article was published in The Birmingham Mail and The Sunday Mercury sensationally headlined "Mr. Sue Sky" last Sunday 30th March. 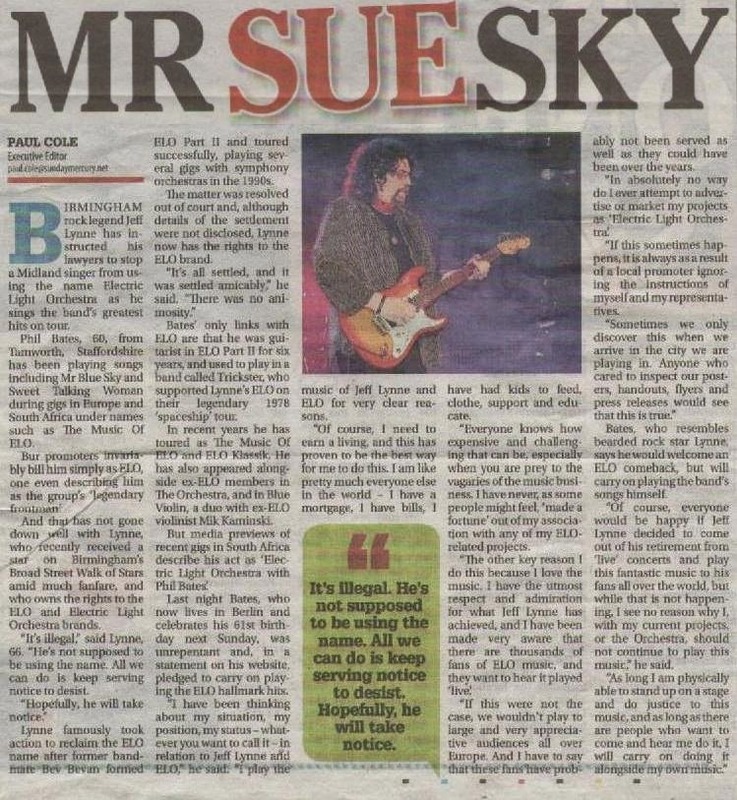 The article centred on the news that lawyers acting for Jeff Lynne have served a "notice to desist" upon Phil Bates due to local promoters in Europe and South Africa erroneously billing the former Trickster, ELO Part II and [The] Orchestra singer/guitarist at times as ELO or even the "legendary frontman". The article sparked long debates within ELO centric Facebook groups and other forums including that of ELO Beatles Forever. Invariably, Yours Truly KJS has been asked for an opinion on the matter during the week, hence this article for ELOBF. Hopefully, the dust has settled a little in the last six days enough for my thoughts to be read and considered as what they are - an opinion - and that this causes no further schism in the ELO fan base between those who support and those who disagree with the output of bands or projects including former members of both ELO incarnations and, by extension, tribute acts. Jeff Lynne requires no introduction. He was the co-founder of The Electric Light Orchestra with Roy Wood and Bev Bevan, he is the majority composer of their recorded material and he the sole owner of the Electric Light Orchestra and ELO brands. As a songwriter and musician, he will recognise that, if successful, people will want to record his songs, copy his arrangements and perform his music live. That is a given. Jeff is also an artist who is always at home in the studio and is essentially not one for touring. Indeed, it has now been 28 years since the last brief ELO tour in 1986 to promote "Balance Of Power" and nearly thirteen  years since the curtailment of the "Zoom Tour Live" shows. Yes, occasionally Jeff will guest in selected live events, but - as a rule - he is a recording artist first and foremost. And if I were Jeff, I would of course be annoyed if anyone else was being billed as ELO [solely] or even as its "legendary frontman". Phil Bates has a unique connection with ELO. He was a member of ELO's fellow Jet Records label mates Trickster, who also supported ELO during their legendary "Out Of The Blue" spaceship themed world tour in 1978. He joined ELO Part II in 1993 to replace the departing Pete Haycock and Neil Lockwood before leaving in 1999, being replaced by Parthenon Huxley. He returned to the band, now renamed The Orchestra [former members of ELO & ELO Part II] in 2007 for another four  year stint before leaving and forming new ELO themed projects whilst touring extensively in Europe and, latterly, South Africa. Phil was also intimately involved with the Beatles, Blues & Blue Violin [BBBV] project with Mik Kaminski and Tina McBain during this time - a fact misreported in the article. Unfortunately, it is those very connections with ELO Part II and The Orchestra as well as Phil's similar facial appearance to Jeff [with his permed hair, glasses and beard] that leaves the door open for certain local promoters of his gigs [either through genuine ignorance or as a deliberate marketing ploy to sell tickets] to advertise concerts by Phil Bates performing the music of ELO as something else. From a legal point of view, the lawyers representing Jeff Lynne could, in all probability, only have Phil Bates in their sights [as an easier target] due to him being perceived as 'guilty by association' with those promoters who were printing and publishing factually incorrect advertising for his concerts. This writer does not believe that Jeff Lynne has a problem with the plethora of ELO related musicians, tribute bands and other artistes who seek to record or perform his music live, as long as they pay their dues and do not make unsubstantiated claims as to their identity or name[s]. This is evidenced by the attendance of members of two UK based ELO tribute acts at his private Birmingham Broad Street 'Walk Of Stars' celebration last month. This writer also does not concur with the newspaper claim that Phil Bates is a "copycat" artist. His permed hair is natural, he wears glasses because he has to and he sports a beard for personal reasons. He often covers songs by other artistes during his concerts including, naturally, The Beatles and others. I met Phil for the first time in 1993, backstage at ELO Part II's Wolverhampton Civic Hall gig, and during the ensuing two  decades, I can honestly report that he has never stated that he is Jeff Lynne [or his successor] and that I have never seen any project with the involvement of Phil Bates billed as ELO but rather always as Phil Bates performing the music of ELO. 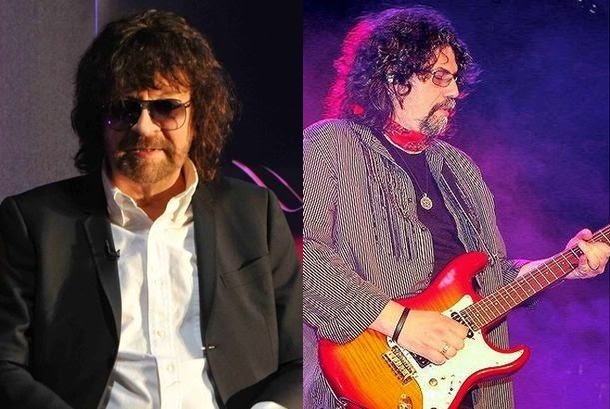 So, we have a successful and prolific songwriter and performer in Jeff Lynne who much prefers the environment of the studio to the stage and Phil Bates, essentially a musician comfortable on stage [with not a few ELO connections] who has been incorrectly promoted on certain occasions as being ELO or the equivalent of Jeff Lynne. On one hand, who else can Jeff Lynne's lawyers focus their attention on - with this controversy - other than Phil Bates himself? On the other hand, with the best will in the world, how can Phil Bates prevent the ignorant or the intentional inaccurate promotion of his shows by foreign promoters? I'm sure that Phil Bates does provide clear communication to local promoters as to who he is [and who he is not]. The same applies to his musical vehicle[s]. Therein lies the frustration, I guess, on both sides. While Jeff remains averse to touring, the many ELO related bands and projects continue to successfully tour and perform his music live - some even with the letters 'ELO' within their name. There remains a paradox created essentially by Jeff Lynne himself in an industry driven by the desire of the public to see and hear the music of a genius who is happier in his ivory bungalow rather than in the gaze of his many, many fans and admirers. For me, there will always be room for Phil Bates in the ELO universe. But there is also no place for the false promotion of any artiste[s]. The first thing I would like to say Keith, is this is a very well written and factual article. I will say I have been "involved" in some of these discussions recently, not because I have supported Jeff or Phil, but some of the arguments have been very harsh. Like you say, you can call me biased if you like, but I think ELO are now more popular than the Beatles in UK and Europe. So with Jeff owner of the ELO name he has every right to take action if he feels it is being abused. Having said that some "fans" have used this opportunity to have a dig at Orchestra and Tribute Bands. They seem to have this notion that only Jeff should play ELO music live. But as you point out, that is unlikely as Jeff is uncomfortable with playing live, and as much as I would like to see him live, I feel it is unfair to force him to do something he simply does not want to do. As for the tribute bands and orchestra, they are touring and touring and touring, keeping the music of ELO alive, and playing it to a very high standard. If you don't like tribute bands (like me) then that's fair enough. But having seen ELO experience for the first time last week, I can tell everyone, that they were sensational. I strongly recommend ELO fans see them, before you judge people have the decency to see them first. Jeff has no problem, so neither should you. Very carefully worded and well written Keith and I guess it had to be after what can only be described as very heated discussions on both sides of the argument over the last week. I agree completely with you, Keith. To me, there is only one good way to respect all Lynne´s rights: Every concert or show mis-adverted must return ALL THE EARNINGS TO THE REAL COMPOSER AND OWNER OF THE E.L.O. TRADEMARK: Mr. Lynne. This way Phil REALLY would take care and say the promoters not to use a name he hasn´t got the rights confusing the people. Ummm.... Every band that tours and plays covers completed a live performance return and pays royalties to the copyright owners. It is NOT illegal for any musician to perform someone elses song so the notion of giving all earnings is ludicrous. As a touring musician of nearly 40 years I can tell you that there is no way a musician can police what promoters do until you get to a gig and even then its too late.. If Phil is in the UK and a promoter in South Africa calls him ELO how is he to know unless someone tells him?? Look at his website. You never see any misleading information..
Ludicrous is using a name that doesn't belong to you Blaming on the promoter, and it's an easy way to not take your responsability. Phil can perfectly warn what the promoters can or can't do. And the perfect solution for me is: Bad use of ELO name=bye bye any profit. Respect! ELO was Roy, Jeff and Bev. ELO pt2 was everyone minus Jeff and Richard Tandy, because the band wanted to play but (understandably) Jeff always wanted to pretend to be a 'Beatle'. Jeff is a musical genius there is no denying that, but let's be honest personally he seems to be a bit mean and also mean spirited. If you remember Kelly Groucutt had to sue him over royalties. When he wanted to tour as ELO again, surely all the fans wanted to see the band back together? Couldn't he have even joined in with ELO pt2? It is mainly his music, his 'mates'. BUT no ELO just EGO, it was him and a bunch of young women, how embarrassing was that? How at least he has a more credible band, but that is not the band the fans want? Maybe that is a cheaper option and he will earn MORE money but touring with unknown session players? As if he really needs that? Then there was his snide comments about 'who wants to play with people that I knew 30 years ago' or 'now I'm playing with good musicians'. So now on top of everything, we have this situation, IF it is really an important issue to you maybe sue the promoters then? Why go after Phil? So, given that we do not know the 'real' situation, it seems to me that Jeff could be a bit more relaxed and be a bit of nicer bloke. It was four years ago! A lot has happened since then! Jeff is protecting his livelihood. He wrote ALL the music, produced the albums. People must understand it is a business. Phil obviously realized he can scratch out a decent living by performing Jeff's music. If promoters slip the ELO name and or loge into the mix it works to Phil's advantage. Sad thing is that Phil has made great music of his own.Trickster and Atlantic were two really good bands that didnt quite make it but not for lack of quality and or trying.Phil needs to quit riding on Jeff's accomplishments and create his own.